Call (951) 737-7272 or Visit http://www.papamurphys.com for more info or to place an order. Eastvale-Pizza is in this country about as American as Baseball, hot dogs, apple pie and Chevrolet. I have heard and even said, jokingly, you can’t trust anybody that doesn’t like pizza. Papa Murphy’s Take ‘N’ Bake Pizza is a one of a kind pizza experience. Each pizza is created with only the finest fresh ingredients, delivered daily. The dough is made from scratch every day, only 100% whole milk mozzarella hand grated, organic hormone free chicken, hand cut veggies and love are used to create a pizza fit for a king to take home to your family’s castle. 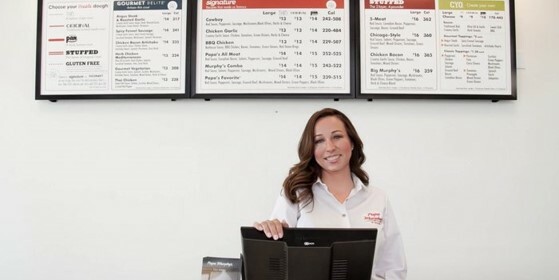 Papa Murphy’s is the fifth largest pizza franchise in the world, Tammy Tubbs the owner and operator of the location in Eastvale has been a fan for over 20 years. She likes to joke that they are “the biggest little pizza chain that you have never heard of.” Tubbs has fond memories of Friday nights as a child spent eating Papa Murphy’s pizza and playing cards or dominos with her sisters. “We have contributed over $26,000 to elementary and high schools, churches, charities and countless fundraising drives over the years,” said Tubbs. Support your local small business to ensure we can continue to support the community for years to com. Tubbs was an active duty officer in the United States Air Force from 1999 to 2007 as a human resource and acquisition officer, stationed across the southwest, including Luke Air Force Base and The Space and Missile Systems Center. In 2007, when she separated from the Air Force she built a very successful defense contracting company in El Segundo. Papa Murphy’s has traditional and gourmet pizza options. They prepare it and you take it home to cook it exactly how YOU like to enjoy your pizza. Fresh salads and desserts made from scratch every morning are also available for your dining pleasure. Great quality, great value and the number one ranked customer service in the industry are the essential core values to Papa Murphy’s and the Air Force veteran. “I wanted to bring families back to the dinner table through food people love,” said Tubbs. For great deals any time visit their website http://www.papamurphys.com. An Eastvale favorite is $10 Tuesday when you can get any large pizza on the menu for $10. You can get 1 large gourmet thin crust, 1 topping pizza on select Fridays for only $5. If you place order online you can receive 25% off your order of $20 or more with the promotional code “25THANKS” now through September 23, 2018. You can call (951) 737-7272 for more info or to place an order.